I spotted this great photo in one of my Better Homes and Garden Magazines. The article associated with this photo was actually about the great head board made from handkerchiefs but what I noticed was what was sitting at the end of the bed. Two vintage end tables pushed together to form a bench. 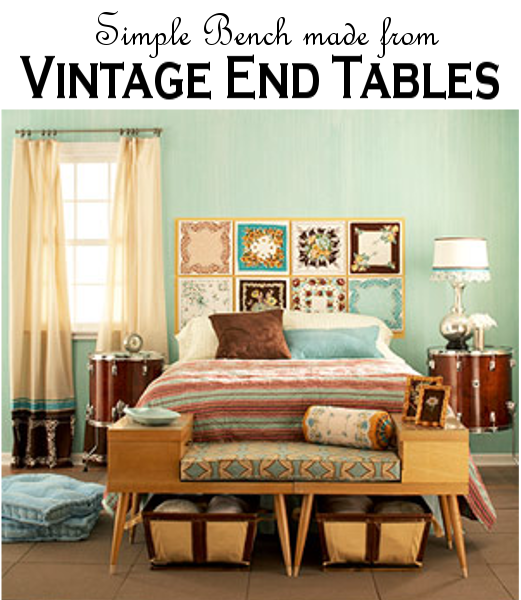 I have seen several of these tables at yard sales and antique stores, usually for pretty cheap, but I never knew what to do with them. Topped with a bench cushion and a couple throw pillows , then add some baskets for storage and this is the perfect addition to any bedroom. I'd love to have a room like that some day, preferably when my toddler learns how not to move things around and out of the room. Thanks for linking up to Welcome Weekend Blog Hop and for including me in your Linky Party List. I'm following you as well. love the headboard! will link on monday.